Tags: Kasa Staff, Kasa-Indian-Eatery, Polk Street, San Francisco. I feature staff spotlights to forge the connection between the food you eat and the people serving and cooking it for you. In an age of technology, which Kasa fully encompasses, I want to cherish the human connection even more. For the majority of our team this is the reason we are in the hospitality business in the first place! If you’ve ever dreamed of owning your own restaurant, bar or coffee shop. I would ask you to read this blog to see if you have what it takes. Andrew certainly does, he is the embodiment of a successful restaurateur in the making. Our industry is notorious for being one of the most difficult businesses to run; evidenced by the number of daily closures of restaurants. We have razor sharp margins to work with and tiny margins of error. We have incredibly demanding bosses: our customers. Everyday we aim to please the entire retail market with all their individual quirks and whims. We have to stand out amongst the wealth of intense SF competition both in terms of quality and number of restaurants. Andrew is young, 26 so he certainly has the electric energy needed to run a restaurant. But it’s not just his youth that makes him so energetic. He’s genetically wired to function at speeds not possible for everyone. Born and raised in Tucson Arizona, he’s the youngest of 6 siblings. He’s been groomed to being bossed around, and been given consistent hard feedback and as a result emerged strong. Ambitious that he is, he left Tuscon at an early age due to the poor job market and lack of stimulating activities. 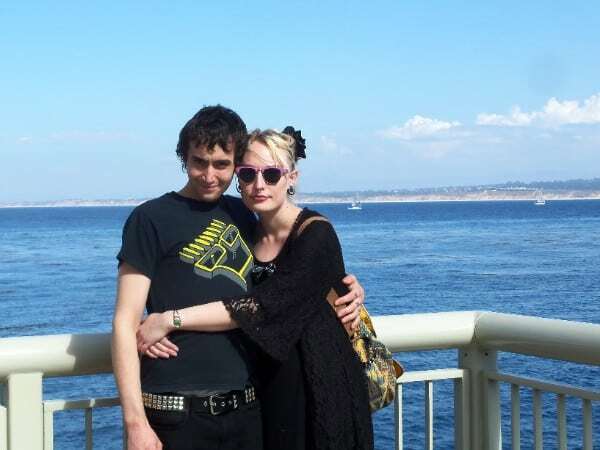 He drove on up alone with his girlfriend to sunny California undeterred by the cost of living here or without any family support. He jumped right into work, eager to succeed. You have to have a fearless ambitious nature to dive into our world. 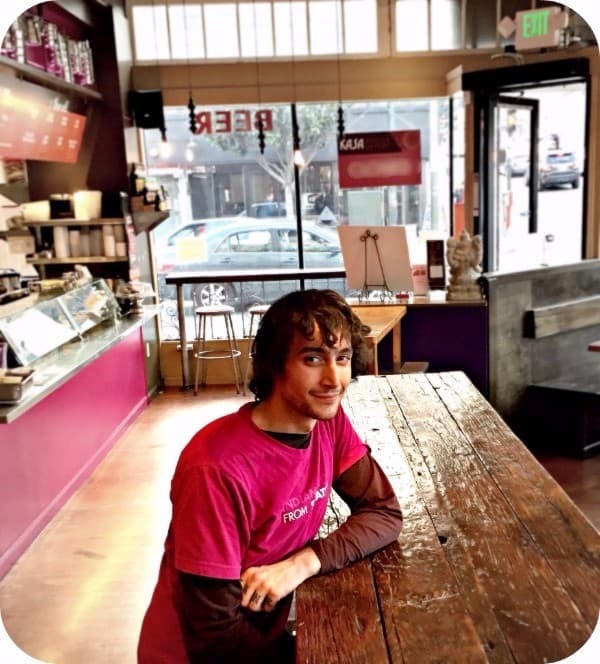 He worked with the SF Soup Co for a while, but they lost out on a gem as he came to work with us in order to have more impact on a small business. He’s disciplined. Unlike the majority of his peers, he does not touch alcohol. He’s had his time in Tuscon of drinking and house parties but decided he would prefer to quit and focus on his goals and save $$$. Whilst this makes socializing a tad difficult, he tells me in a matter of fact way, that he can handle that no problem. He has plenty of friends and they have plenty to do together without alcohol. Skateboarding and Rock music are two of his huge passions outside of work. Passionate – You have to have passion for creativity and the talent to go with it. He’s an artist & musician. In a previous life, he was a muralist. (Look out for a t-shirt coming up designed by him soon), and plays the bass and electric guitar. Most importantly for us, he can cook! Yes you need some serious culinary skills to be involved in the business. If not you will be beholden to a moody chef that can make or break your business. This next month’s community dinner will be created and cooked by Andrew. Stay tuned for more details on that. Common sense old school maintenance skills – These are ones that the majority of folk can happily go about their lives without having to ever worry about. In our world though. You had better know how to deal with electrical, plumbing, tiling issues as well as putting up shelves and fixing refrigerators. OR know a really good, reliable and affordable handy person. What has Andrew not done? – He also used to be a welder – so he can check that box too. People person. Invariably you will have to lead, connect with and inspire teams. Andrew has those qualities. His team members see him as somewhat mysterious. In reality he shrugs his shoulders and explains to me he’s just professional. He keeps his personal life to a minimal at work. His team consider him approachable, respectful and always there to have your back. So now you know the gem that is serving you! As well as some knowledge if you have what it takes to open your own restaurant – (with hopefully a lot of starting capital). We celebrate two years of working with Andrew this February and he’s become a big part in the heart of Kasa. I personally have a lot to learn on his life’s perspective. He loves the people. They are friendly and outgoing – “Keep coming back!”.